The Rams didn't punt until they led 35-23 with 7:38 to play, but the Chargers couldn't get into the end zone in the final 23 minutes of the game. Jared Goff was about four weeks old the previous time two NFL teams based in Los Angeles played each other. When this long-dormant derby returned in its newest form Sunday, the young quarterback was the biggest reason why the Rams won this round in the long fight ahead for the hearts of LA. Goff passed for 354 yards and three touchdowns, and Todd Gurley rushed for 105 yards and another score, leading the Rams to a 35-23 victory over the Chargers in the franchises' first meeting since their relocations to Los Angeles. "It felt like a good rivalry," said Goff, who was 29 for 36 in perhaps his most impressive pro performance. "I think you could feel the crowd. You could tell there were two sides in here. Ultimately I think we had a little bit more, being at home, but you could definitely feel it. I think they are a great team, we're a great team, and hopefully that can continue for a long time." 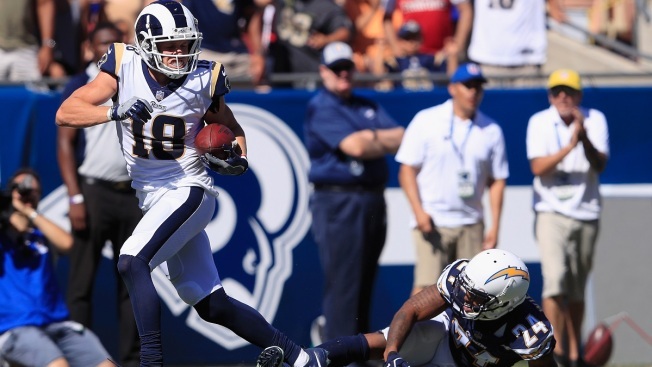 Cory Littleton blocked a punt in the end zone and Blake Countess recovered it for an early touchdown for the Rams (3-0), who racked up 521 yards and remained one of the NFL's four unbeaten teams. Two seasons after the Rams kicked off professional football's return to the nation's second-largest market after 21 years away, they got their first meeting with the Chargers, who moved a year later. Both teams put on an entertaining show for a Coliseum crowd of 68,947 containing a surprisingly significant turnout of Chargers fans, but the Rams' offensive brilliance kept them ahead all day. These teams are likely to have a friendly coexistence in LA instead of a real rivalry, since they'll only play each other roughly once every four years while they share a multi-billion-dollar stadium complex in Inglewood starting in 2020. Neither side ascribed much cultural significance to this win — but the Rams were thrilled to defend their turf. "Coming out, they were kind of loud, but I think we quieted them up," Rams receiver Robert Woods said. "At the end of the game, you knew whose house it was, who is LA's team." Woods caught two TD passes and Cooper Kupp made a 53-yard scoring catch from Goff. Philip Rivers passed for 226 yards and hit Mike Williams with two touchdown passes for the Chargers (1-2), whose two losses have come against the powerhouse Chiefs and Rams without injured pass-rusher Joey Bosa. Melvin Gordon rushed for 80 yards and a score . "(The Rams) are good in all areas, but I feel like we had a lot of opportunities to make plays," Williams said. "We know the talent that we have in the locker room. We've just got to put it on the field." Despite their prolific offensive performance, the Rams never got comfortable. They lost starting cornerbacks Marcus Peters and Aqib Talib to injuries during the game, and the Chargers twice drove deep into Rams territory in the fourth quarter, only to come away with three points. Chargers rookie safety Derwin James got his first career interception in the end zone to kill a likely scoring drive, but he blamed the defense for the loss. "We couldn't get a stop," James said. "We made them punt one time. Offense put up enough points." The Rams racked up 313 yards and held the ball for almost 20 minutes in the first half, but also committed two red zone turnovers that allowed the Chargers to stay close. Gurley fumbled on the Rams' opening drive, and James picked off Goff in the end zone in the second quarter. Kupp and Goff put the Rams up 28-13 early in the third when Goff evaded pressure and slung a perfect, long throw to Kupp, who shook off Trevor Williams' tackle and ran away. James, the Bolts' stellar rookie safety, went out of bounds at the 1 after his pick, and the Chargers eventually had to punt out of their end zone. After a Bolts blocking mistake, Littleton easily blocked the punt to give a 21-6 lead to the Rams. "Everything went perfectly for us, and that was the result," said Littleton, who is still playing special teams even after becoming a starting inside linebacker this year. "It was wide open. You don't get those very often." Chargers: P Drew Kaser injured his leg when Littleton rushed in to block his punt in the first half. Rivers replaced Kaser as a kick holder in the first half, but Kaser returned for the second half. ... WR Travis Benjamin missed his second straight game with an injured right foot. Rams: Peters injured his leg during the first half and had to be helped off the field. The Pro Bowl selection didn't return. Talib then left in the second half. McVay said the Rams will know more Monday. ... Kick returner JoJo Natson injured his hand in the first half and didn't return. He was signed two weeks ago to replace injured Pro Bowl returner Pharoh Cooper. ... LB Dominique Easley was sidelined with a knee injury. McVay didn't know the extent. Chargers: Host the San Francisco 49ers on Sunday, Sept. 30. Rams: Host the Minnesota Vikings this Thursday, Sept. 27. With only three days to prepare, the players were already getting extensive treatment in the locker room after the game. "Recovery process starts now!" receiver Brandin Cooks yelled.